NMB Talab Khata is designed to provide one stop solution for your convenience, to help you make the most out of your salary. It offers unique features and benefits relevant to your needs. Special Feature: No Charge on cash withdrawal from any ATM all over Nepal plus Accidental Insurance of NPR. 700,000 (in words: Seven Lakh only-). The applicant must have payroll account with us and salary has to be routed through our Bank. Cash withdrawal charge in any ATM in India at NPR 150. Accidental death insurance coverage- 5 times of account balance (one day prior to death incident) or 7 Lakhs whichever is lower. 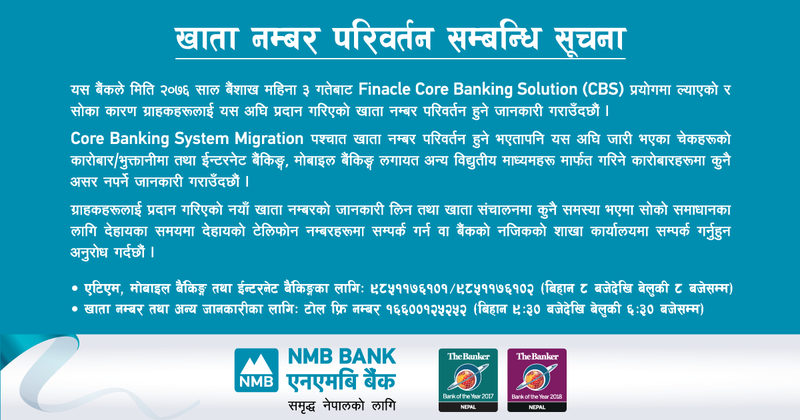 25% waiver on loan processing fees for loans availed from NMB Bank. What is NMB Talab Khata? 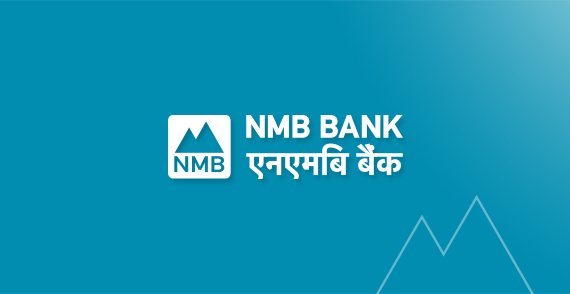 NMB Talab Khata is a payroll savings deposit product especially designed for employees/ salaried individuals with unique feature of no charges on cash withdrawal facility from any ATM all over Nepal and Accidental Death Insurance of 5-times average deposit or NPR 500K whichever is lower. What is the interest rate of NMB Talab bachat khata? Interest rate on Talab Khata is 6.50% p.a. (subject to change). This is one of the highest interest earning products amongst the available products with us. What is the minimum balance requirement for NMB Talab Khata? The minimum balance requirement is Zero. What is the frequency of interest payout for NMB Talab Khata? Interest earned on Talab Bachat Khata shall be calculated on daily basis and credited on Quarterly basis. What are the features of NMB Talab Khata? Free unlimited cash withdrawal through any ATMs inside the country. Accidental Death Insurance of 5-times average deposit or NPR 500K whichever is lower. What is the procedure of opening account under this product and the documents required from employees? Certified valid Passport copy or Identification document issued by Government of India along with letter of Indian Embassy. Other details shall be required as per NRB directives and its amendment. 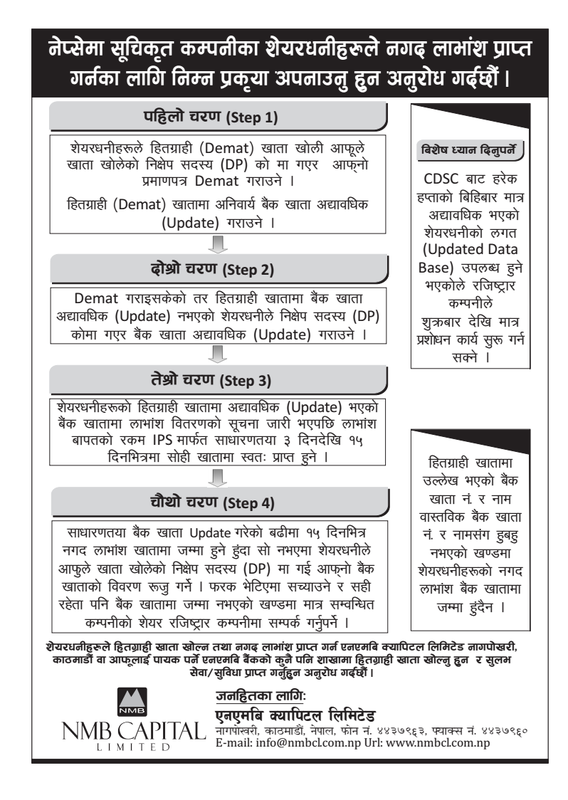 Certified copy of lD or refugee which has been issued by Nepal Government or other authorized body/agency shall be obtained instead of Citizenship Certificate. What are documents required to open the company account? What is eligibility to open the account? • The organization must have opened current account in its name. • The applicant should be a Nepali Citizen or hold valid identity card in case of foreign nationals • The applicant must have payroll account with us and salary has to be routed through our Bank. Are there any charges for closing bank account? There are no charges if you close your account after six month of account opening date. However if you close your account before 6 months, the closing charge is Rs. 100. How do I start online and mobile banking? You can select internet and mobile banking option at the time of filling account opening form or later you can visit nearby branch to activate this service. After the activation you will receive 4 digit SMS txnpin and GPRS login in your registered mobile number. You can use mobile banking in offline as well as in online mode. In online mode GPRS login will be used while in offline mode SMS txnpin will be used. • For mobile banking: GPRS login will be used as a mobile banking password and SMS txnpin will be used as transaction password. 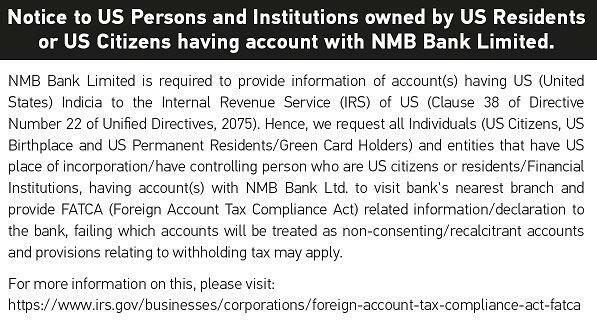 • For internet banking: You will receive an e-mail from NMB bank stating user id and login password.